Blogging is a relaxing hobby for some, while, for others, it represents a steady source of income. Regardless of your blog’s role in your life, writing and publishing content using slow, clumsy web interfaces may not be the best solution, especially when a powerful desktop alternative is available. 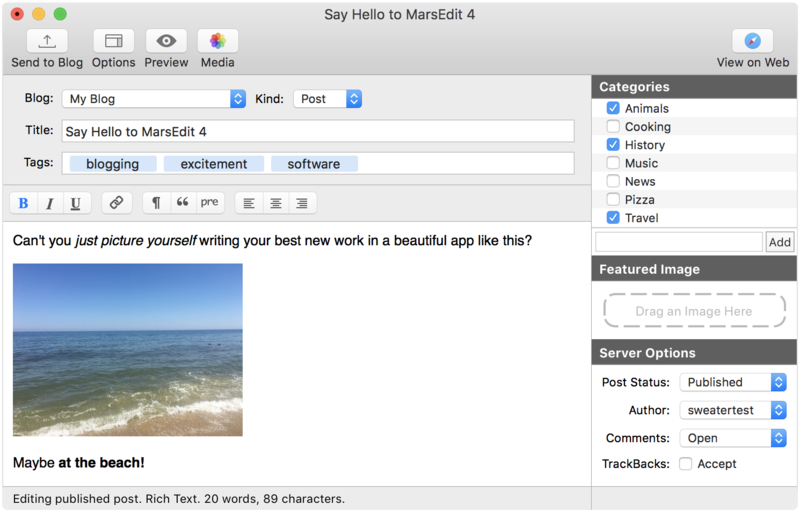 MarsEdit allows you to do all your writing from a native Mac app, while also offering an impressive amount of helpful features. MarsEdit can be used to manage blogs being hosted on WordPress, Blogger, TypePad, Tumblr, Movable Type or any other service that supports the MetaWeblog or AtomPub interface. It is possible to write using HTML, RTF or even Markdown, and the app displays a live preview to show you how the post will look after being published. Moreover, MarsEdit can be integrated with TextMate, WriteRoom, TextWrangler or BBEdit, as well as other text editors that support the ODBEditor suite. Furthermore, the application allows you to search for content in your iPhoto, Lightroom, Flickr or Aperture libraries, and import images with a single mouse click. While you can certainly write blog posts in other editors and format them once you have access to the web service of your choice, this method takes more time and requires quite a bit more work. With MarsEdit, you can write whenever you want, regardless of the availability of an Internet connection. Your posts are saved as drafts and can be uploaded as soon as you get back online. There is no denying that MarsEdit is a great app for the job it was designed for, but its interface has not changed a great deal for many years. Mind you, it is very easy to manage and has a simple, intuitive layout, but it is starting to show its age. On the whole, however, MarsEdit is a great tool for any blogger who wants to get their work done more quickly and from any location, as it offers numerous helpful features and allows one to prepare blog posts even when no internet connection is available.